Fennel, a plump green bulb with a mild anise flavor, is a member of the parsley family. There are three types of fennel: bitter and sweet which are used for herbs, and Florence fennel that provides a vegetable in the form of a bulb. Florence fennel is also known as finocchio, which is the general Italian word for fennel. 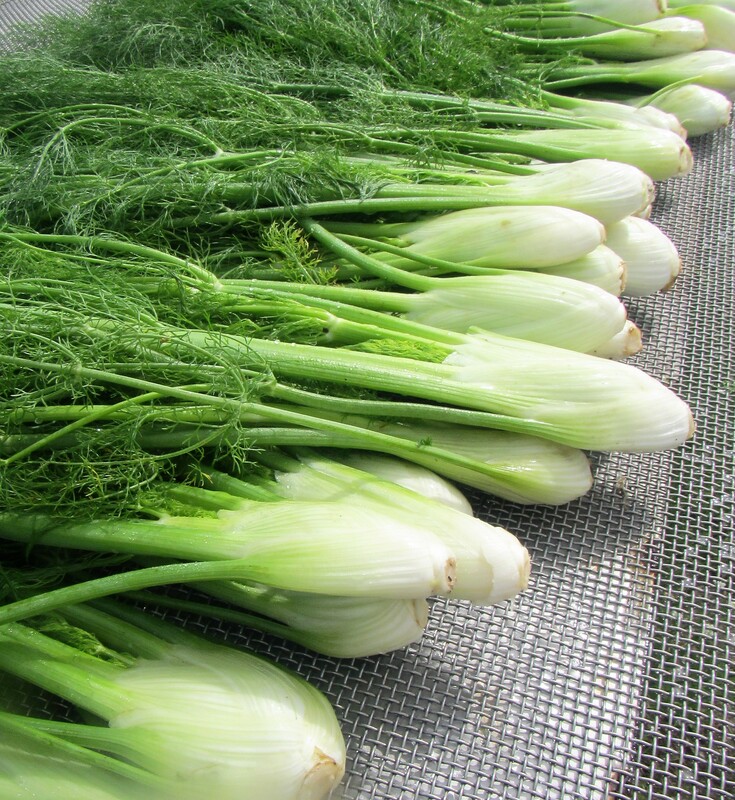 Finocchio was developed in Italy during the 17th century and is often used to distinguish fennel grown for the bulb versus varieties grown for seed. Keep fennel refrigerated in a plastic bag, but try to use it sooner than later, as it tends to dry out quickly and the outer layers will brown. Visit this page for tips on storing and drying herbs. Small bulbs are best for salads since they are tender, while larger bulbs are best suited for braising and baking. Fennel makes an interesting substitute for celery, and it takes well to braising, sautéing, grilling, and eating raw in salads. The feathery greens can be used for garnish or for seasoning egg salad, potato salad, or seafood dishes. Since the stalks are stringy, they are best used in soup stocks or throw them on the BBQ for aromatic smoke, cut off the stalks just where they emerge from the bulb. Fennel has a core, which is visible once the bulb is cut in half. If the bulb is small it isn’t necessary to remove the core, but if the bulb is large the core will need to be removed with a paring knife. Fennel pairs well with olive oil, butter, thyme, orange, lemon, tomatoes, potatoes, olives, garlic, Parmesan and Gruyere cheese. If thinly sliced, the bulb makes a nice addition to an antipasti platter or goes well with pork.